Many of us do it, but few of our clients allow it, let alone prefer it. Work remotely, telecommute. Sure a year or so ago the boss says we don't trust you do anything. Funny we always provide results, but who reads reports anyway. 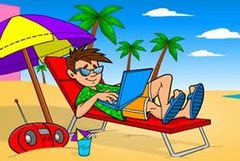 Now, because of the economy, the notion of a remote worker is appealing because the company still gets tax benefits off of you, gain some real estate in the office, reduce salary line in budget(outsourcing goes under a different line item, which in some cases, like hiring a US company is tax beneficial), reduce benefits overhead, reduce pc/laptop and various connected items costs as well, which in turn reduces help desk calls and others. IBM has been letting people work remotely, almost forced to do so in some cases for at least a dozen years now, probably the Lotus side has been doing it even longer. So as I sit here in London and plan for a number of projects and meetings, our clients would not know I wasn't still in Boca Raton, if I didn't tell them. Remote access, Lotus Sametime, Skype, a US VOIP phone number and local UK SIM chip for my cell phone makes working global easy. So does a wireless router provided from my Internet company. If your business hasn't done it yet, why not? Need help with it? Let me know I can help with the project plan that will blow your boss away. Be warned, this will not work if you have the pointy haired boss that only wants head count. Thanks for the interesting post.The obvious benefits of increased flexibility and less travel time for workers makes telecommuting an attractive choice for many. But employees are not the only ones to benefit from full or part-time telecommuting. By allowing their staff the convenience of working from home, business owners experience lower overhead, an increase in employee productivity, and a higher level of employee satisfaction. Exactly my points. The problem is my friends in commercial real estate are not amused. One VOIP central line and a stack of phones and one is ready to go. While telecommuting has it's benefits, there are also a lot of problems associated with it. Trey, Please elaborate on your thoughts. From an employee, consultant or outsourced entity it's the best way to work. From a client perspective it may not always work out, but the client should have their own guidelines in place to support it.